During the Middle Ages travel from place to place had not really been necessary as most villages and towns produced the majority of things that they needed themselves. As the population grew in Tudor times and towns began to specialise in particular trades so the need for better roads arose. Although improvements did occur in the area, Walsall’s roads remained in a poor state. After the Turnpike Act of 1747 was passed by parliament turnpike companies built several new roads around the town. For the privilege of continuing on your way travellers either paid up or remained where they were! Inevitably some people were exempt from paying the toll; these included Members of Parliament travelling to and from London (now there’s a surprise! ), serving soldiers, funerals, voters on election day and road menders…..charging the latter would be rubbing salt in the wounds! At the bottom of the map shown below can be seen “Dog Kennel” referred to in the Bull’s Head details later in this post. The lack of detail is due to the fact that the map this section is taken from was drawn up to show the boundaries of Walsall Borough only. Anything outside the perimeter, i.e. Hammerwich Brook and Mr Darwall’s bridge, was in the Foreign. 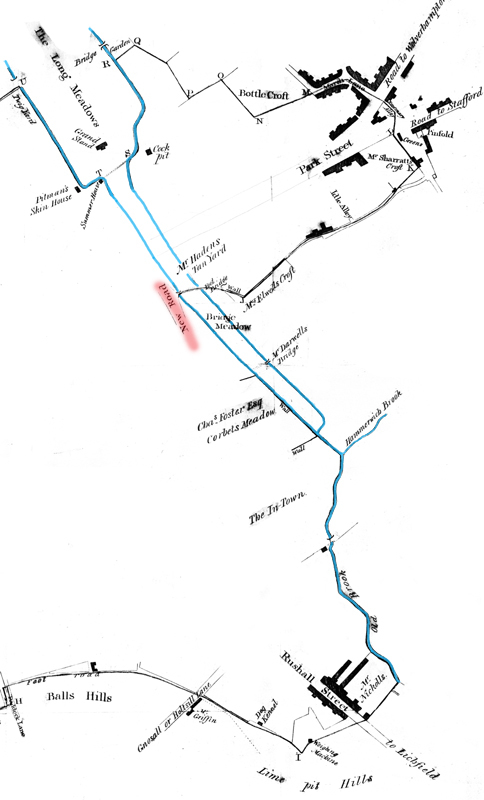 A section of an 1814 map showing New Road (Bridge Street) highlighted in red, the watercourses that ran through the town are shown in blue. In the mid 18th century several roads around Walsall were made, or renovated, including one of the most important, Bridge Street which opened in 1766. The effect that the opening of this road had was to effectively move the centre of the town from the Market Cross to the Bridge. Imagine where Bridge Street now merges into The Bridge, by the HSBC Bank, this was a rural scene around 1766, a brook lined with overhanging trees sheltered the cattle and horses that came down from the Wisemore meadow to drink. Prior to Bridge Street opening the town may have been picturesque but practical it was not, traffic attempting to move down Park Street in the direction of Birmingham had some serious questions asked of it. One of the local manufacturers commented “Walsall is the worst town to pass through I ever saw”. After crossing the Bridge, any traffic began to climb the one in eight gradient of High Street, when it reached Market Cross it had a choice, but not much of one! Carters and coachmen could either go down (Upper) Rushall Street to Ablewell Street which was only around ten feet (3m) wide or negotiate the equally narrow switchback curve of New Street and then into Birmingham Street. Whatever the choice it was a difficult and time-consuming journey. Heavily laden wagons had to have half of their loads removed at the bottom of Digbeth so that draught horses could pull them to the top, then wait while the remainder of the load was brought up and re-loaded. A group of local merchants decided enough was enough and a new road should be constructed, parliament was petitioned and eventually it was agreed that their wish would be granted. 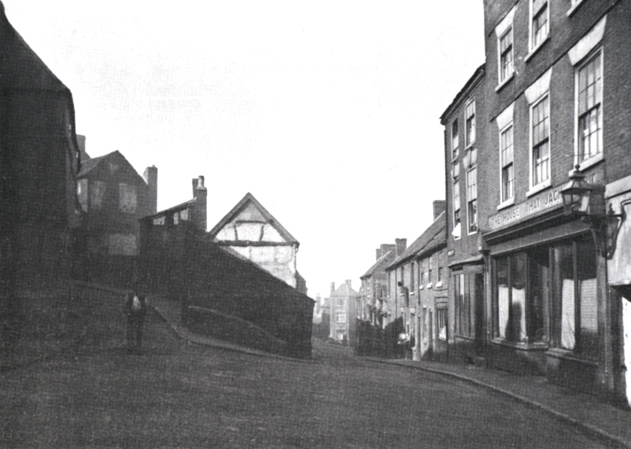 Just like today however, the plan did not meet with approval from everyone in the town, the main protagonists were the tradesmen in High Street and Rushall Street whose businesses would be bypassed by the new road. They organised a petition to oppose the new plans, but their fears fell on deaf ears and the construction of Bridge Street was given the go-ahead. When the new route opened it quickly proved its worth as the ascent was a much more gentle slope for traffic to negotiate. Prior to this revelation in town planning Walsall only had one coach that called but very soon the town became an important coaching centre. The sole visiting coach only called at the Three Swans and Peal in Peal Street and there were more hostelries in the town than travellers back then and they were spoilt for choice for places to sleep and eat. When Thomas Fletcher, who previously ran the Green Dragon in High Street, opened the George Hotel in 1781 it gave the town the prestigious establishment it needed to put itself on the coaching map. Its location was excellent, its imposing form standing at the bottom of Digbeth and the new Bridge Street, however it didn’t always have the imposing frontage that we are accustomed to seeing. Up until 1823 the main entrance was on the side of the building in Digbeth and consisted of a few stone steps surrounded by railings that led to a narrow doorway. The George proved a popular venue at the time of Walsall Races with sporting celebrities of the day staying over. Thomas Newton the saddler describes walking into the dining room one race day evening and being introduced to the sporting writer Charles Apperley, better known as Nimrod, “Mad” Jack Mytton, Bob Thacker, Tom Evans, Jack Jesson, Joe Curtis and other “sportsmen”. Apperley, under his pen name Nimrod, wrote and illustrated a book titled Life of a Sportsman and one of the illustrations shows Mad Jack Mytton at the George Hotel. Other frequent visitors were Lord Hatherton and Lord Derby, the latter taking over the entire hotel with his entourage when travelling between London and the family seat at Knowsley Hall near Liverpool. Lord Derby did once have a runner at Walsall Races but it unlikely he attended such an insignificant (to him that is) meeting. A carte de visite produced by the Bridge Studios showing The George c.1890. The Observer printing offices referred to by Isiah Holden are on the left of the picture. 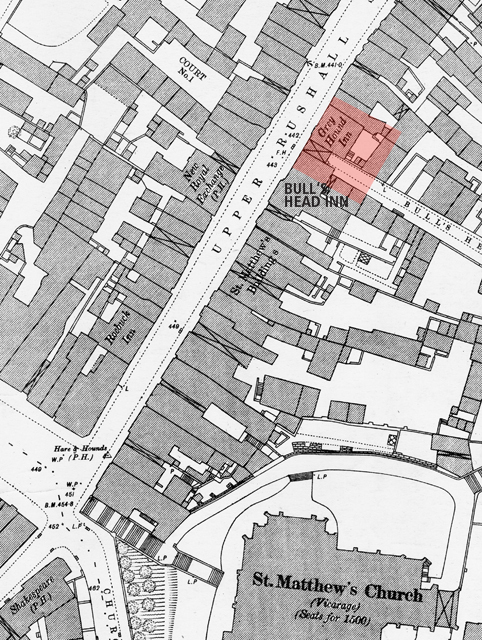 The George’s biggest rival was the Bull’s Head in (Upper) Rushall Street which stood on the opposite side of the street and just a little further down from today’s Lyndon House Hotel. In the 18th century it was known as “Waltons” and became a meeting place for the town council and the local hunt whose dogs were kept in nearby Dog Kennel Lane off Holtshill Lane, see map at the beginning of this post. Its notoriety as a coaching house and thriving hostelry was helped by the fact that the Chester Coach changed horses at the Bull’s Head, when the horses had been changed the coach would set off down High Street and as it neared the George Hotel the guard would fire his off his blunderbuss as a token of defiance. Coaches setting out from the Bull and the George at the same time would use the Bridge as starting point for a race to Lichfield, galloping the horses recklessly and with scant regard for their passengers well-being. One report states that the life of a coaching horse, working under these conditions, was rarely more than three or four years. In consequence of these harsh working conditions large numbers of chestnuts and dapple greys were bred for the purpose. 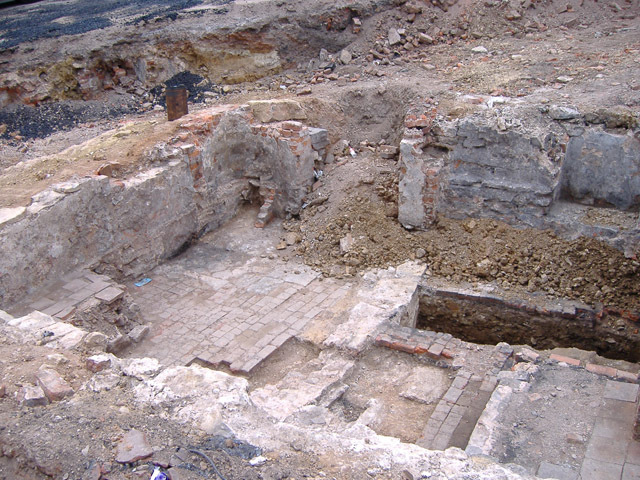 It was said in its heyday the Walsall coaching houses had well over one hundred horses in their combined stables. It must have been quite a sight to see these coaches in full flight with the echo of post-horns around the streets, the snorting of horses and the squeaking of leather on metal, mixed with the commands from the drivers and guards. The coaches had some wonderful names; the Red Rover, Estafette and the Railway from London to Manchester; the three London to Liverpool coaches, the Crown Prince, the Aurora and the Magnet; the Albion from London to Chester and the Amity that ran from Wolverhampton via Walsall to Sheffield; the slow coach, the Lazy Liverpool, so called because it carried the luggage of passengers on the faster coaches. Two were well-known for racing each other, the Standard Pearl and the appropriately named Rapid. It is reported that on one occasion they travelled from Walsall to Birmingham in 28 minutes, changed horses and then carried on to Derby! Forget trains, bring back the coach and ‘osses! Children also enjoyed the rivalry, taking sides to shout and cheer on one or the other coaches. The coaches and carriers that came through Walsall. From Pigot & Co’s Staffordshire Directory of 1828. 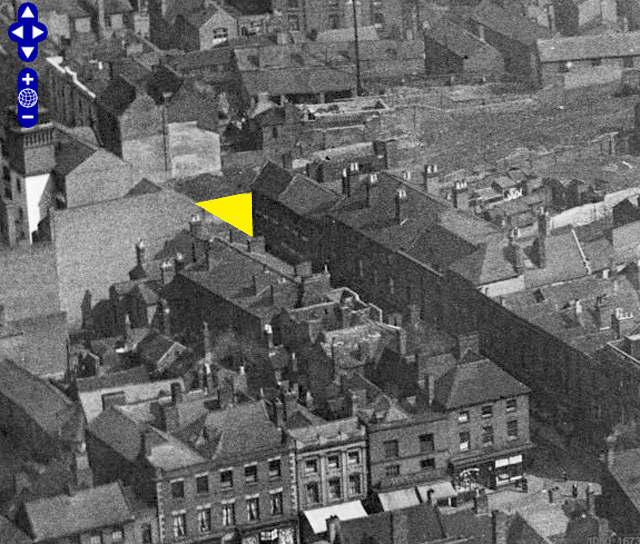 The yellow triangle shows the approximate site of the demolished Bull’s Head and Greyhound pubs in this image from Britain From Above. The vehicles were well turned out, highly polished brasses shining and the coach name displayed in gilt letters on polished door panels and well groomed horses. It was said the guards on the Red Rover, who all wore red hats, were earning an astonishing £15 a week with tips, around ten times that of the working man! As well as passengers they carried goods too, on the first of the month the coaches were heavily laden with magazines and needed six horses to pull it, with four extra for the tricky road between Walsall and Cannock. 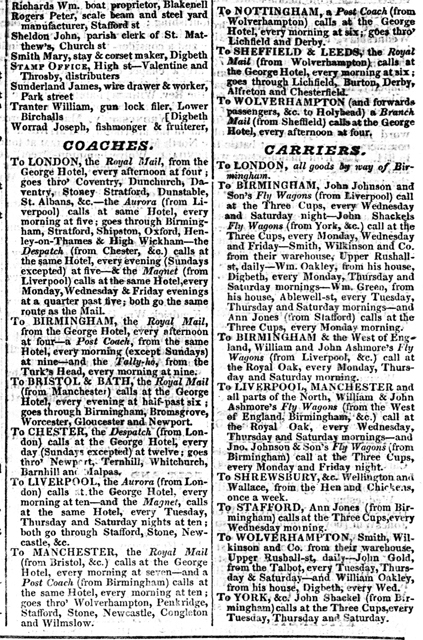 The timetables had to be strictly adhered to and it is said coachmen and guards were fined 2s 6d (12.5p) a minute for falling behind schedule. Many serious accidents occurred including one carrying convicts from Chester to Portland. 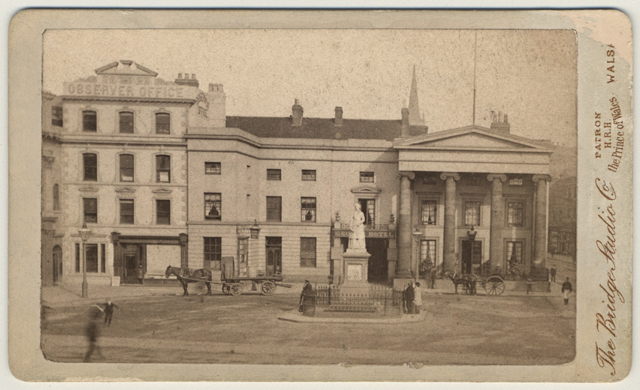 At Pratt’s Bridge four of the eight horses got the better of the coachman and bolted, as the runaway neared the top of Park Street it collided with the carriage of Mr Perks, the Sheriff’s Officer. The coachman and Mr Illidge, deputy Governor of Chester Gaol, were both killed. When one drives, or walks, over the new road that now joins Ablewell Street to Upper Rushall Street think what history is under your tyres, or feet! 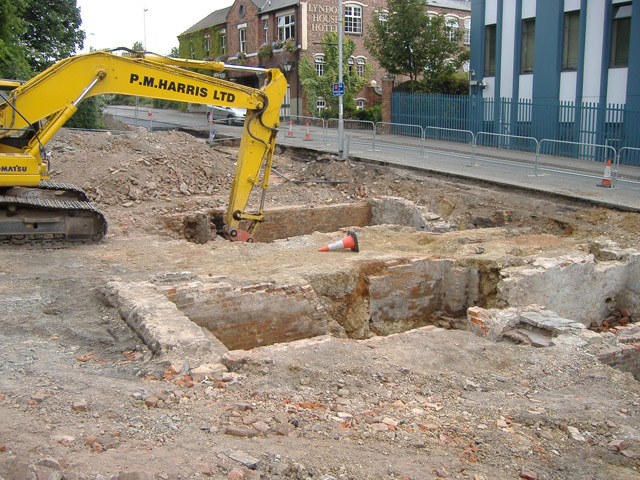 In July 2006 the road was being excavated by the contractors and the remains of the Bull’s Head and Greyhound inns were found under the existing pavement and road. The following photographs show the remains which were uncovered, the accompanying section of Ordnance Survey map shows the approximate area of excavation and the location of the Bull’s Head and Greyhound pubs. In the picture below one of the workmen told me they had found numerous articles whilst excavating and the day before I took these photos they found several which they placed on the oven for the archeologists to collect. The next morning they had all gone, strangely the workman seemed surprised, I did not! 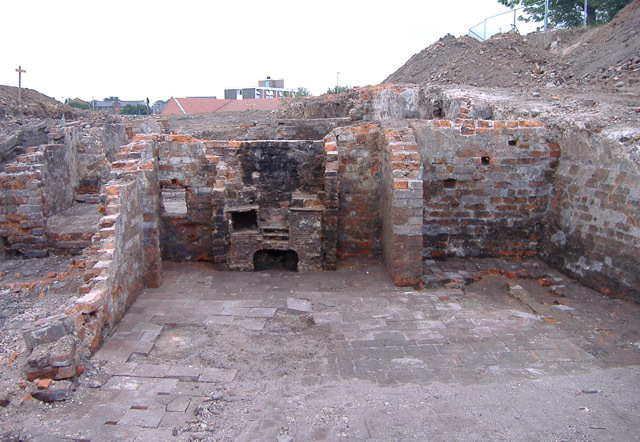 An oven revealed in one of the ground floor rooms or cellars. This is very close to the area once occupied by the Bull’s Head. Earthworks a little further down the street possibly on the site of the Greyhound Inn. More excavations with the Lyndon House Hotel in the background. The area the photographs were taken is highlighted in red on this 1885 Ordnance Survey map. The New Royal Exchange opposite is now The Lyndon House Hotel part of which was the first Walsall factory of the electrical manufacturer, J. A. Crabtree & Co.
You are currently reading The wheels of progress at Walsall Life.